Inventory management function allows user to perform stock in/out online, configure inventory lower limit and optimum quantity. 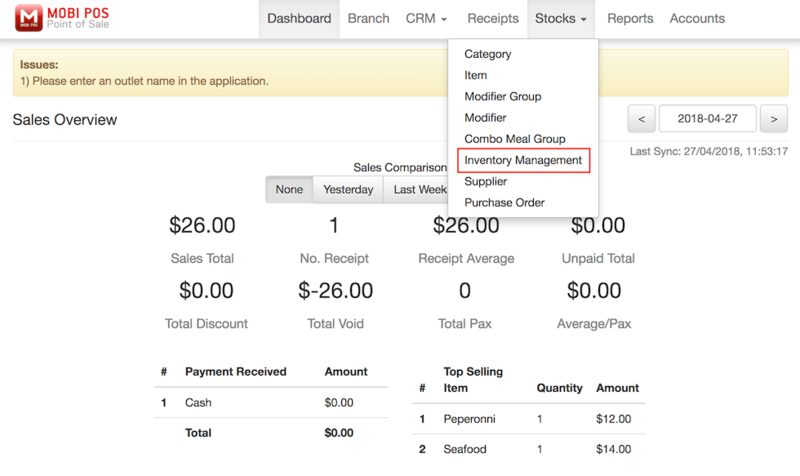 To use Inventory Management feature, login to MobiPOS CloudSync, then go to Stocks -> Inventory Management. All the items along with the inventory, lower limit, optimum quantity, supplier price and suppliers will be shown in the Inventory Management page. User can filter the items based on category for easier access at top left corner. Inventory - Shows the current inventory available for item. Lower Limit - Represents the lowest inventory possible before its stocks have to be replenished. Optimum Qty - The ideal item inventory count to have after each stock replenishment. Supplier Price - Price of the item provided by the supplier. Supplier - Supplier which provides this item. 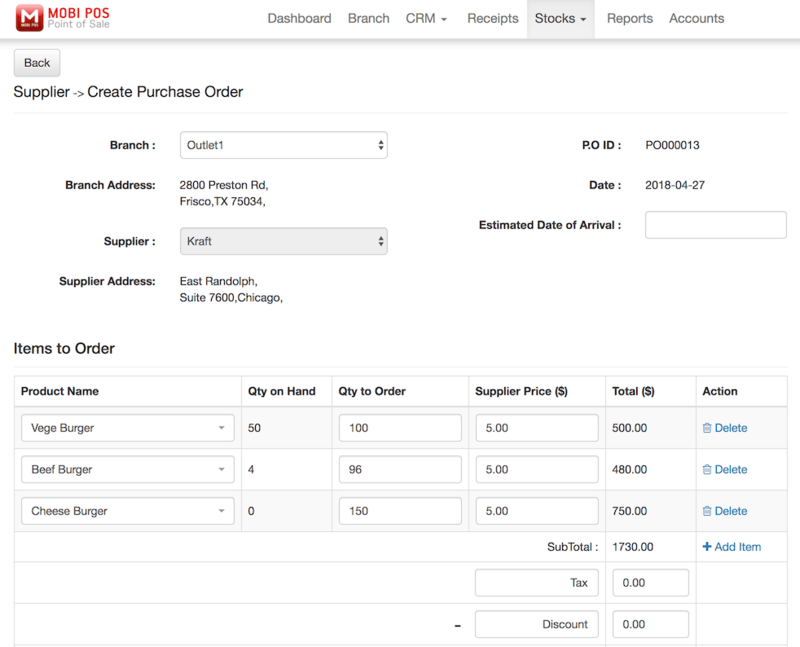 Configuring all these information helps in automating the creation of purchase order. During the creation of purchase order, with information provided, system is able to calculate the stocks amount to be replenished automatically. For example, if the item's optimum quantity is set to be 150, lower limit is set to be 20 and the quantity on hand is 15. The quantity to order will automatically be 135 in purchase order creation page. To create purchase order based on the supplier, go under Stocks -> Supplier then Create Purchase Order under "Action". All items that are below the lower limit will be populated in this purchase order. Quantity to order will be calculated and shown automatically according to the information inserted at the Inventory Management page. This reduces the hassle to search for each product item and calculate the order quantity to be replenished. For more information about purchase order, do refer to Purchase Order guide. 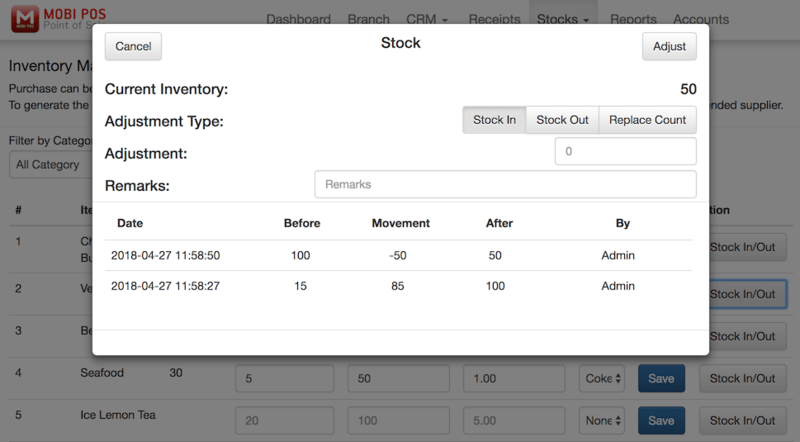 Back in inventory management, user can do manual stock/in out or adjustment as well. Under Action section, there is a Stock In/Out button. Upon clicking it, you will be presented with a page similar to iPad stock management. User can adjust the inventory quantity under this tab. Key in the adjustment quantity, choose the adjustment type, then click Adjust. Stock In will add the adjustment count on top on the current on hand quantity. Stock Out reduces the current on hand quantity based on the adjustment. Negative symbol is not required. Replace Count allows you to key in any amount that you want the final inventory on hand figure to be. For example if the on hand quantity is 50, you put a replace count of 150, the adjustment will automatically be a stock in of 100. * Do note that performing stock in out in the cloud will reflect the changes in the iPad only after the iPad syncs with cloud. * Inventory on hand might not be as accurate if outlet is currently operating.